I was having a mixed reaction to THE MAGICIANS for the first hundred pages or so. I thought the story was interesting, yet it was also kind of snoozy and unengaging at times. But then the Antarctica sequence happened and I was sold! Even just the passage describing the flight of the geese was so incredible I couldn’t help falling in love with Grossman’s prose. The novel turned snoozy again a few times after that — it’s hard to summarize entire years of schooling in a handful of paragraphs and still keep it lively, just as it’s hard to present bored, jaded characters with few interests outside of drinking without risking boring your reader, too — but the final third of the novel, when THE MAGICIANS is fully in conversation with portal fantasies like THE CHRONICLES OF NARNIA, is where I thought it truly came alive. I think Grossman must have been a prickly teenager, because he gets prickly teenagers exactly right in Quentin Coldwater. He also gets right that strong, seductive feeling of finally finding someplace you belong when you get to college and make friends you really click with, and the nebulous anxiety that overtakes you as college draws to an end, and the fear of the indifferent outside world after graduation. In fact, Grossman nails so many of the character-related details that it almost comes as a surprise that he also nails so many of the fantasy-related details with equal accuracy. I greatly enjoyed THE MAGICIANS, despite the snoozy bits, and am looking forward to reading THE MAGICIAN KING next. In this short prequel to “The Witching House,” when Abigail Blackwood claims her hippy commune family has been massacred, Sheriff Travis Keagan and his deputies investigate. They discover there’s more than weed smoking going on at Blevins House. Much more. When Marty Weaver encounters three killers who like to play sadistic games with their victims, his own scarred past is unearthed. And when his pain is triggered, blood will flow…and hell will rise. Beneath the city of Boston, evil is gathering. While living under a bridge with the homeless, journalist Daniel Finley witnessed something that nearly cost him his sanity. Now, with a book published about the experience, he’s caught between the Irish mafia and a deranged cult preparing to shed blood on the street. 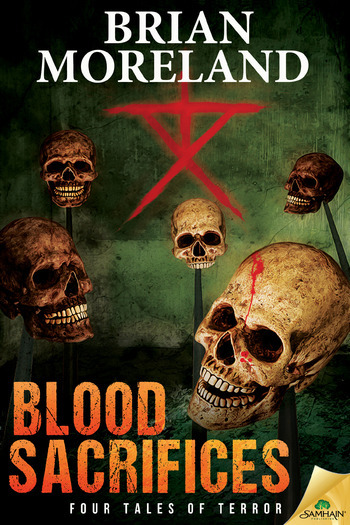 Blood Sacrifices is a collection of three novellas and one short story inspired by two of my favorite authors, H.P. Lovecraft and Clive Barker. I love how both authors create feelings of dread with their prose and fill their stories with fantastic monsters, ancient gods, and a sense that there are other realms beyond the ones we can see. Each story in my collection is about ordinary people encountering extraordinary horrors that come from alternate realms, especially “Darkness Rising” and “The Vagrants.” And each story has at least one scene that frightened me as I wrote the scene. In the opening short story “The Girl from the Blood Coven” and its novella sequel, “The Witching House,” what started out as a haunted house story turned into something more when I began to discover the mysteries of what made the house haunted. It began in 1972, when a coven of witches were murdered inside the three-story rock house. Sheriff Keagan and his deputies are the unfortunate souls who have to investigate the house that had once been a hippy commune, isolated in the backwoods of East Texas. If you were to drive through some of that thick pine country, just some of the country roads are scary enough, and so are the people who live deep in the pines. What Sheriff Keagan discovers inside the Old Blevins House gave me chills as I wrote the story. “The Witching House” takes place forty years after the massacre. Sarah Donovan, her new boyfriend, Dean, and a married couple, Meg and Casey, are members of an urban exploring club that likes to explore abandoned haunted buildings. When they hear that the Old Blevins House has been boarded up for decades, they decide it would be fun to break in and explore it. What they soon discover is that the house is more than just a little haunted. There’s something living down in the basement that’s hungry for human blood. Now, the basement has always been a scary place for me. There’s an otherworldly feeling I get when I go underground or inside a tunnel. When I was younger I was afraid of the dark and claustrophobic, while at the same time being a curious explorer who liked to scare myself for the adrenaline rush. I once explored the water drainage pipes that ran beneath the neighborhood. I crawled on all fours through a maze of tunnels through pitch darkness, spider webs, with all my fears of death prodding me along. I ended up crawling out of a sidewalk drain about a mile away from where I started. I also enjoyed walking through abandoned houses, especially ones with basements, even though they spooked me. The cellar smelled earthy, like a creek after a heavy rain. At the bottom was a dirt floor. White mushrooms clustered in the corner. Casey’s hiking shoes sank into damp, black soil that hadn’t seen sunlight in over a century. He saw fingers moving in the dirt, and his breath caught in his throat. It was an illusion brought on by a sudden fear. The fingers were actually earthworms poking their heads out to observe this giant intruder. Casey stepped over them and ventured into the gloom. There was a chill down here that prickled his skin. A few cold drops dripped onto his neck and rolled down his back, making him shiver. Tilting his headlamp up, Casey saw beads of dampness clinging to the ceiling. The wood overhead was covered in a skin of black mold. Spores of the stuff floated in the air; he inhaled them, tasted the blight on his tongue. Another drop of moisture struck his forehead and ran stickily down his cheek. He wiped away the scourge and moved on, eager to find his bare-skinned nymph. The basement was as pitch-black as any underground cave. Impossible to tell how far it went. The more he pressed, the more he kept finding dark upon dark. There seemed to be nothing down here except dirt and mushrooms and moss-covered walls. The deeper Casey walked, his mind kept going back to the witches who had vanished in this house. A question burrowed at the back of his brain: If all the cult members were murdered, who killed them? Casey will soon discover the answer to that question. Inside the basements of abandoned houses and old buildings of the stories that make up Blood Sacrifices, I tapped into my fears of the dark underground places that can lead us to other worlds where fantastic horrors have been waiting for us to enter. 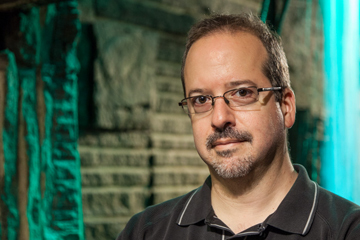 Brian Moreland is a best-selling and award-winning author of novels and short stories in the horror and supernatural suspense genre. In 2007, his novel Shadows in the Mist, a Nazi occult thriller set during World War II, won a gold medal for Best Horror Novel in an international contest. The novel went on to be published in Austria and Germany under the title Schattenkrieger. Shadows in the Mist, Dead of Winter, and The Devil’s Woods are his currently available novels, as well as his Kindle short-story The Girl from the Blood Coven and the novella it led into called The Witching House. Now, he has released the full-length The Devil’s Woods. 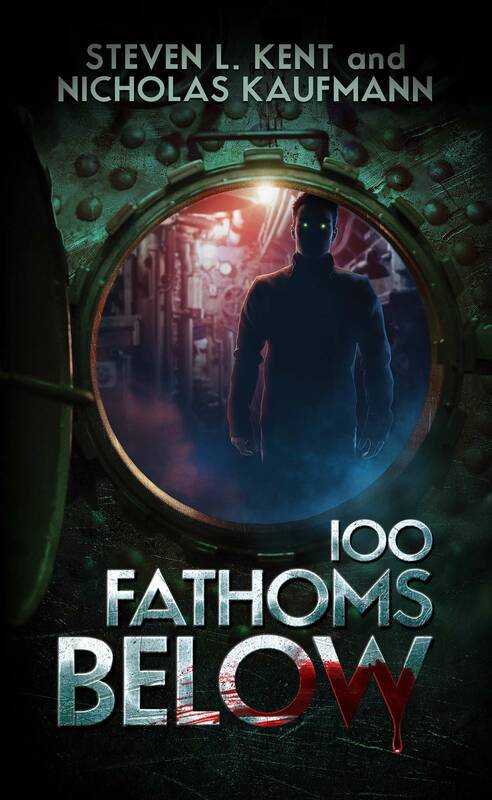 His novella, The Vagrants, was released in 2014, and another, Darkness Rising, in 2015. He loves hiking, kayaking, watching sports, dancing, and making guacamole. Brian lives in Dallas, Texas where he is diligently writing his next horror novel. When not working on his books or books for other writers, Brian edits documentaries and TV commercials around the globe. He produced a World War II documentary in Normandy, France, and worked at two military bases in Iraq with a film crew. 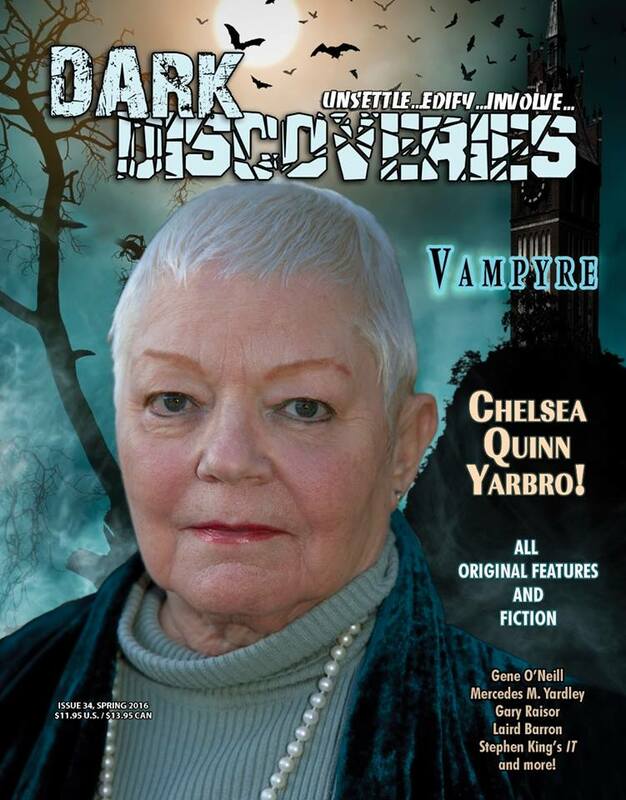 “Whatever Happened to Solstice Young?”, my first brand new story since 2014, will be appearing in Dark Discoveries #34 alongside Chelsea Quinn Yarbro, Laird Barron, Darren Speegle, and many other fabulous authors. The issue is due on newsstands by the end of the month, but apparently you can already pre-order a copy for yourself at the Dark Discoveries website and have it sent right to your door, bypassing any cashiers who might give you a strange look for buying a horror fiction magazine. Don’t miss out!